July is UV Safety Month—an excellent time for those who spend their workday outdoors to review how to protect themselves from the effects of the sun's harmful rays. 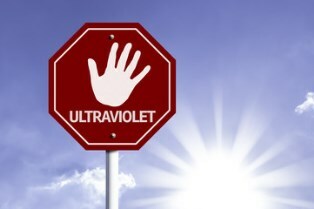 Ultraviolet (UV) light is a kind of electromagnetic radiation from the sun that you can’t see but causes suntans and sunburns, especially during the summer months. UV rays are strongest during the midday. While poplar recommendations for minimizing the effects of sun exposure suggest avoiding time outdoors during the midday hours, this isn't always possible for gardeners, construction workers, lifeguards, and others who essentially spend their entire workday outside. In this case, it's recommended that workers take plenty of breaks and utilize tent shelters, cooling stations, or natural shade sources. Sunscreen is a must during the summer months, with an SPF of 15 or higher being recommended to protect you from the sun's harmful UV rays. However, for maximum effectiveness, sunscreen must be reapplied every two hours. Remember to apply the product liberally, as most adults don't use enough sunscreen to be effective. You need about one ounce of product per application to adequately protect your skin. Carefully chosen clothing can also help minimize the effects of sun exposure. Specially marketed UV protective clothing is available, but dark denim jeans and a bamboo/cotton or 100% polyester shirt can provide many of the same benefits at a fraction of the cost. A wide-brimmed hat that covers the ears, neck, and face can protect you from getting burned in the body’s most sensitive areas. Sunglasses are a must to avoid eye damage. Knowing your own personal risk factors plays a key role in helping you stay safe. Fair skinned people with light hair, freckles, and blue or green eyes are most susceptible to the effects of UV rays. Additionally, the medications you are taking and your family's history of skin cancer can also increase your risk. Sunburns result in red and painful skin after unprotected sun exposure. A minor sunburn will cause temporary discomfort with possible peeling, but a burn that blisters can be quite painful and potentially become infected. Additionally, sunburns of any type cumulatively increase a person's risk of developing skin cancer, which is the most common type of cancer in the United States. Heat exhaustion is a serious complication of sun exposure characterized by dizziness, nausea, vomiting, muscle cramps, headache, fatigue, and weakness. Victims may also have heavy sweating accompanied by cold, clammy skin or a weak or rapid pulse. Mild to moderate heat exhaustion can be treated by moving to a cool area, drinking fluids, removing tight or heavy clothing, elevating the legs, and sponging or spraying cool water over the body. Untreated heat exhaustion can lead to heat stroke, the most serious sun-related illness. This occurs when your body temperature rises to 104 degrees Fahrenheit or higher. The brain, heart, kidneys, and muscles can sustain severe damage when a victim has heat stroke. Someone suffering heat stroke needs immediate medical attention. Many people don't realize that sun-related injuries can occur as the result of your job and qualify for workers’ compensation benefits. If you've suffered heat exhaustion, heat stroke, or severe sunburn at work, you may be entitled to workers’ compensation benefits to pay for your medical expenses and lost wages. Employers have a responsibility to provide a safe environment for their workers, which means allowing for ample breaks to rest, hydrate, and apply sunscreen when temperatures are high. If possible, employers are expected to adjust work hours to limit sun exposure during peak temperatures. You're not required to retain an attorney to file for workers' compensation benefits, but having someone to advocate for your needs can often help expedite the process. Neblett, Beard & Arsenault’s experienced legal team is committed to helping Louisiana workers who've been injured on the job access their workers' compensation benefits in a timely fashion. Please contact us online or call us directly at 318.588.6303 to schedule a free, no-obligation case review.